Tinkering with old 8 bit home computers to see what can be done with modern solutions. The RC2014 is a great idea that has built a huge following for a reason. The latest CPU board brings out some of the CPU signals that are enabling things like the z80ctrl card. Great for the hobbyist. Easy to build. Thoroughly recommended piece of kit. I bought the more expensive pro version which initially seems a bit expensive, however I wanted that over the cheaper versions for the following reasons. 1) Many people seem to want the easier to build versions so there is less soldering, but I actually wanted a fairly serious soldering project so I could play with a new iron I had recently bought, so the more bits to solder on the more enjoyment for me. 2) I can see the appeal of having a cheaper version that can run BASIC, but I figured I wouldn't be satisfied unless I could run a full-on OS. Sure enough this project provides hours of fun because not only do I get the enjoyment of building it and seeing it work, it is also simple enough that you can understand what is happening in your computer. I can see and understand how the serial ports are working and the data is being addressed and moved about, which I find fascinating. Additionally being able to run CP/M means I can do a sort of archaeology involving learning and understanding this old OS, and also see the lineage that pokes through to modern systems. I can also play and enjoy old Infocom games, and I have the option of bolting more things on in the future. One slight problem is that there isn't complete hand-holding step-by-step build instructions, so you do need to think a bit about what you're doing, but a bit of problem solving just added to the enjoyment for me, others may get a bit frustrated. Thoroughly recommended piece of kit. ...the kit arrived today (sooner than expected) so I thought I'd solder it up and get it working as a surprise. The well laid out and labeled board made it very easy to assemble - I only had to refer to the docs on github for resistor and IC positioning, and jumpers. The github page is also very well done and usage instructions + links to software well very welcome - it's nice to be able to start playing with the minimum of hassle. I'm also happy to report the card itself functions perfectly with very good sound quality. Yes, my daughter was very pleased and has spent a good deal of time today downloading and playing .pt3 files between sessions of Zork. Congratulation, a real good and interesting product. I found everything excellent in all aspects. Documentation is a bit messy, in pieces it is to be worked out like a puzzle ! It reveals to be adequate at the end. The kit arrived in short order and was packaged very well. I ordered the RC2014 Pro and added the I/O, twin joystick and Pi zero boards. The boards were nicely laid out and easy to solder. I am a PCB Designer and Electronics Engineer so I had very little assembling everything. I got things working first time although it was a struggle to find and collate the documentation on line. I would like to offer my thoughts regarding the kit. As an exercise in soldering it was easy but tedious. I swapped all the IC sockets for machined pin ones. The pageable Rom board has provision for a zif socket but if fitted per the silkscreen, the handle will hit a couple of IC’s due to their height in their sockets. I ended up turning it 180 degrees so the handle is pointing out from the board. This of course works but you have to remember to put the rom chip in the same direction (which is 180 degrees on the zif socket). Also, the holes for this socket on the board could be bigger. I had some zif sockets that had much wider pins and would not fit. I ended up canaballizing a couple of other sockets to get it to fit. Having the handle stick out from the board is also not ideal as it is too easy to flip it and unseat the rom. I completed the extended slots by adding a 20 pin header to every slot. That way I can put things just where I need them. The cards with a single row connector should still be using a double row connector. The reason is that mixing single and double row connectors results in uneven height and the holes by the chamfer on each board don’t line up. Also, the double row is much more stable and the boards don’t tend to lean over and touch each other. I added a 7805 with a heatsink but it would be nice to be able to switch between it and the USB. Replace all the jumpers with dip switches on the edge of the boards so I don’t have to keep removing them to reconfigure. 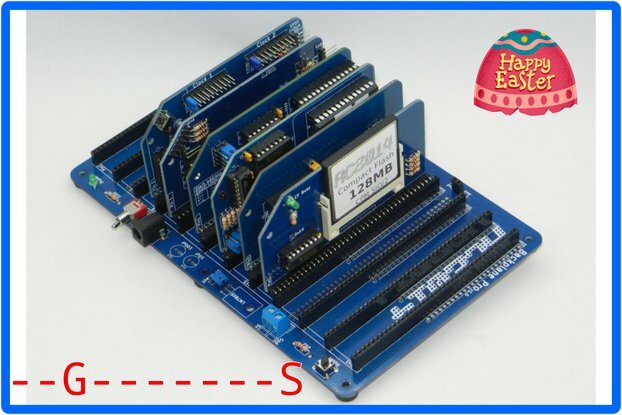 I could see this project as a SBC that, instead of a backplane, was a single board that had individual sections that could be populated according to whatever you need. Some other boards that I think would be useful (and I see they were available at some tme) would be an IDE interface, 4X20 LCD or small graphic display, I2C expander, sound card.